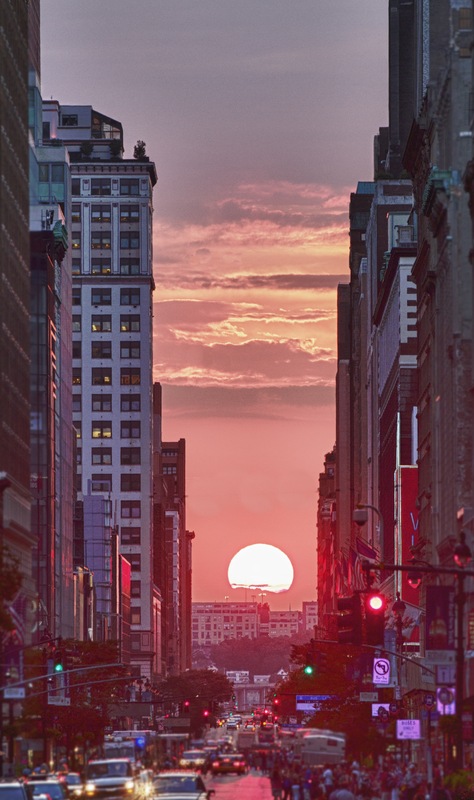 Manhattan Solstice or ‘Manhattanhenge’ is one of two days every year when the sun sets exactly in line with the crosstown streets of Manhattan. Because New York’s grid isn’t aligned exactly along East/West, this phenomenon doesn’t occur on June 21 (like in Stonehenge), but on two days spaced evenly around summer solstice (this shot was taken on July 11, 2012). this photo is truly incredible. i am very, very impressed. i hope to see this for myself one day! Nice photo. I witnessed this a few summers ago and it truly was a sight to see. Well done. Cheers. Love this. I can’t believe that for all the years I lived in Manhattan I never knew this took place. Thanks for sharing!